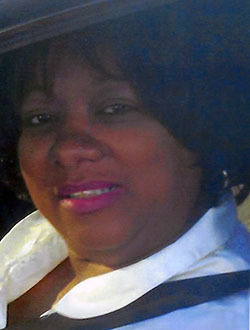 Rosa M. Pearson, 57, of Hamden, entered eternal rest on January 14, 2019. Ms. Pearson was born in New Haven, CT on December 2, 1961, a daughter of the late Robert Pearson and Daisy Mae McKnight Pearson. She was employed at Yale-New Haven Health and was a member of Wayfaring Ministries. Rosa leaves to cherish loving memories, her son, Jimmie Lee Wilson, IV (Delbra); a brother, Leroy Pearson; sister, Janie L. Pearson; two grandchildren, Xavier M. and Dylun D. Wilson; and a host of other relatives and friends. She was predeceased by brothers, Ricky D. and Willie J. Pearson. A celebration of Ms. Pearson’s life and legacy will be held Tuesday, January 22, 2019, at 11:00 AM at Wayfaring Ministries, 29 Marne St. Rear, Hamden. Viewing will be held at the church from 10:00-11:00 AM. Burial will be in Hamden Plains Cemetery. My prayers go out to the family. Rose was a very sweet and nice person, never came to work with an attitude, always smiling ,and very bubbly, she will definitely be missed. Please accept our condolences. We pray our Heavenly Father give you all comfort during this time and for moments to come. 2 Corinthians 1:3,4. May God Keep and Bless Rose’s family my condolences. The time we had on Earth was so precious and you always made me laugh at work. I will miss you dearly.